Zion Williamson and Duke outlasted Virginia on their home court. Duke and Virginia’s Saturday night showdown at Cameron Indoor Stadium was the rare matchup between teams each ranked No. 1 in the polls. Virginia entered as the last undefeated team in the country after Michigan’s loss earlier in the day, but Duke remained the most hyped and most talented team in America. Zion Williamson, R.J. Barrett and Duke outlasted Virginia 72-70 on their home floor. 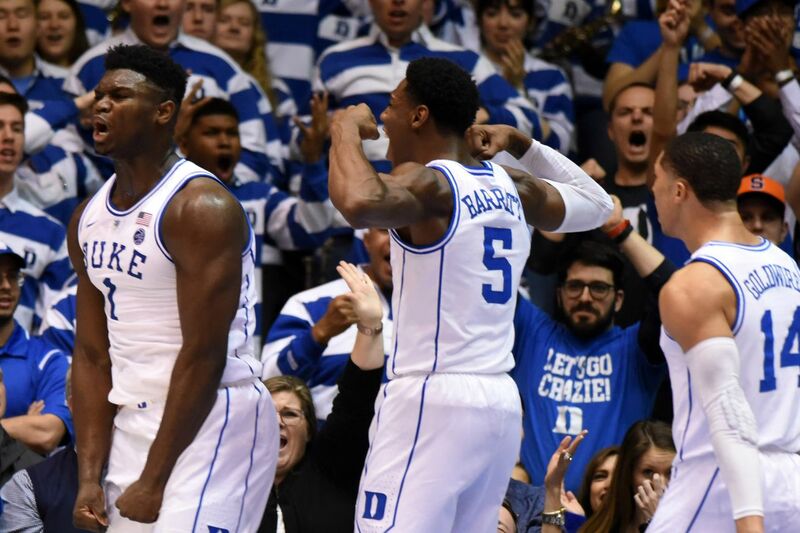 The game was defined by wild swings in moment and lead changes throughout the night, but Duke’s pair of freshmen stars took over down the stretch to lock down the victory. This was a hard-fought defensive battle from the opening tip. But when Duke needed a basket late, Williamson and Barrett forced their way to the rim and found a way to finish. Virginia, for all of its excellence on both ends of the floor, simply didn’t have the horses to finish off a team with likely the first two picks in June’s NBA draft. Here’s three things we learned in this game. Of course, Williamson is so much more than a dunker. He finished the night with 27 points and nine rebounds on 10-of-16 shooting from the field, while also making some game-changing defensive plays. Williamson initiated Duke’s offense as the de facto point guard without injured freshman Tre Jones, and Virginia had no answer for it. There is no doubt Williamson is going to be the first overall pick in June’s draft. College basketball fans should feel lucky to see him at this level, even if it’s only for a year. The Cavaliers went on the road and took Duke down the final possession. Credit the Hoos for controlling the pace the majority of the night and finding a way to run Duke off the three-point line. We know Tony Bennett’s teams annually have one of the best defensive units in the country, and they proved their worth again by limiting Duke’s offensive output for most of the night. Virginia’s three stars all played well. De’Andre Hunter led the team with 18 points, while starting guards Ty Jerome and Kyle Guy each added 14 points. Braxton Key chipped in 11 points off the bench. There’s a rematch in three weeks on Virginia’s home floor. We can’t wait. Who knows, we might even see these teams meet again in the Final Four. Jones sprained his shoulder against Syracuse on Monday, leaving a major void at point guard for Duke. He’s a projected first round pick in his own right, a savvy facilitator, ace perimeter defender and arguably Duke’s emotional leader. Duke just defeated one of the five best teams in the country even without him. That’s how good Williamson and Barrett are. As Williamson starts to steal headlines, it’s worth noting Barrett was also a stud in this game, finishing with 30 points on 11-of-19 shooting and icing the game down the stretch. No one does that against Virginia. Give us this rematch right now. And give it to us again Minneapolis. Duke remains college basketball’s biggest heavyweight, but Virginia showed why it’s a national title contender even in defeat.